1 , Jinan, Liaocheng, Dezhou , Shijiazhuang, Yinchuan, Lanzhou Power Supply Bureau . . . . . .
2 , Huaneng, Datang Power 's major systems . Imports of iron , weighing only only one -third of other manufacturers . 0.5 Digital True RMS meter , without outside with standard CT and ammeter . Suitable for single busbar current transformer protection and parity changes , and can relay and switch on the current transformation ratio , time, over-current, quick-break , transmission and other tests tuning parity. Current Accuracy : The currents are smooth smooth continuously adjustable, accuracy better than 0.5 , the current true RMS voltmeter display , high precision and high stability . Just set the test output voltage , target current and step length , the device will automatically test , do not need manual operation. Equipped with RS232 communication interface and USB interface to connect laptop to operate, data can be saved , you can upload to PC or U disk stored on other computers on display, print . 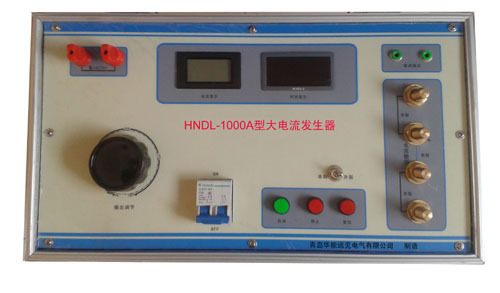 Special three-phase current generator temperature rise is based on the power sector and industrial and mining enterprises in the electrical equipment tests, such as : all kinds of busbar , switches, current transformers and other electrical equipment to do the current load test and temperature rise test specifically designed and manufactured a special device. This series of products depending on the product size, weight, one-piece , split structure, with output current stepless adjustment , using the 0.1 standard transformers , digital display, the current rise balance, load variation range , reliable , easy to operate , and security features . Industrial and mining enterprises for raw stream or an ideal temperature test equipment .